This is more like it! I know Valiant was pushing X-O Manowar to be the new flagship title for the their relaunch, but I feel like Harbinger should have been the flagship book. There was just so much cool going on in this book! I'm not sure how much of this story matched the original series, but this one was fantastic. The best way I can describe it is a mix of Akira and the movie Chronicle with a side helping of X-Men. Peter Stancheck, a harbinger who may be able to bring about a catastrophic future, is recruited by Toyo Harada to join his Harbinger Foundation and help not only gain control of his power, but also give Peter a place to belong. 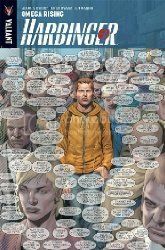 Soon, thought, Peter discovers that not everything at Harbinger is as it seems and that he has been manipulated. After escaping from Harbinger with the help of another harbinger, Peter knows he has to strike back against Harbinger. Honestly, I really loved this book. In fact, I can't remember a graphic novel that I enjoyed as much as this. The story is great; the pacing is spot on; the art is fantastic. This is definitely a series that I will be following as future volumes are released!